Any time we read a book with students, comprehension is a priority! However, comprehension instruction and practice take different forms, depending on the type of instructional activity we are doing. In today’s post, I focus on how to address comprehension during shared reading activities. 1. The first time you read a text, focus primarily on comprehension. As I explained in previous shared reading posts, I usually reread a shared reading text several times with my students. There are so many different things that can be taught with just one text—fluency strategies, decoding strategies, sight words, print concepts, phonics patterns…the list goes on! At the same time, I try not to make the shared reading experience too “teacher-talk heavy.” I do some modeling, sure, but I also have students actively participate by asking them to share what they are thinking, make predictions with a partner, share prior knowledge and new learnings, retell the text after we finish reading, and so on. Typically the only other thing we do during that first reading is a little decoding work (because the words are new to the students, this is a great time for me to model a decoding strategy and/or have them help me choose a decoding strategy to figure out a tricky word). This decoding work is quick, since our focus is comprehension. 2. Save many of your higher-order thinking questions for your rereads. During our first read of a shared reading text, I ask some literal comprehension questions to get students thinking and see if they are understanding the text. I may ask a higher-order thinking question as well. However, many of my kids will be more successful with answering higher-order thinking questions after they’ve heard the text more than once. So I make sure to ask 1-2 of these types of questions every time we reread the text. If you were the main character, how would you have solved the problem? How can you take what we learned from this text and use it in real life? What would you add to this text? What was the most important part? Why? What does the author think about this topic? How do you know? If you get in the habit of asking 1-2 of these questions each time you read your shared reading text, it will a) get students comfortable with answering these questions, b) provide support through multiple rereads, and c) remind you to address comprehension in some way each time you read the text—even if your main teaching point is something different, like fluency or decoding. 3. Remember to actually TEACH comprehension strategies, rather than just asking questions. Asking students questions is an important part of shared reading (or any reading experience). But when we ask a comprehension question, we are mostly trying to find out if students comprehended the text. We have to ALSO teach them HOW to comprehend the text in the first place! This is where comprehension strategy instruction comes in. These are things that we want our students to do during shared reading AND on their own. Shared reading is a great time to introduce strategies, model them, and help students as they try them out with the shared reading text. 4. Have students participate in the meaning-making process as much as possible! Although teaching comprehension strategies is a “must,” we don’t want shared reading to be all about teacher talk and modeling. If you think about the gradual release of responsibility, shared reading falls somewhere in between a readaloud and guided reading. In a readaloud, we do the vast majority of the work. In guided reading, students do most of the work. So shared reading is somewhere in-between. 5. Find fun ways for your students to demonstrate their comprehension of the text! If you’re looking for more guidance in teaching comprehension during shared reading, check out my NEW Flexible Shared Reading Units for Reading Workshop! 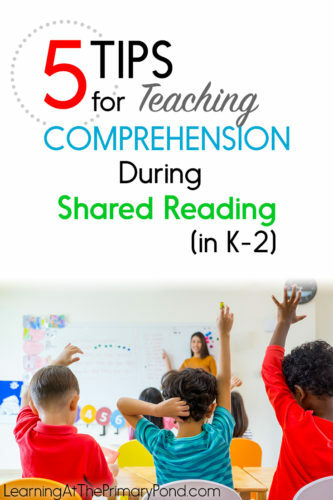 These lessons are for K, 1st, and 2nd, and they provide book and activity ideas for teaching comprehension (and many other strategies) during shared reading.